As long as the president of the United States was named Bush, the vice-president Cheney, and, especially when the Secretary of Defense was named Rumsfeld, French commentators found little good to say about America. Although both are democratic republics with roots in 18th century revo lutions, the French treated the U.S. as a foil. It represented a land where something had gone wrong. A country which had begun in a revolt against a foreign overseer had itself morphed into an imperialist power. A society based on the principle “of the people, by the people, for the people,” was now a place where the forces of capital could dictate policy to the elected representatives and supposed servants of the people. Hollywood movies, American television shows, music, fashion, and even the American language all retained favor, but there was little but disenchantment about what once had been a shining light now gone dark. Fast forward to 2009. The election of Barack Obama has kind of put a quick end to automatic America bashing. Indeed, things have almost turned around 180 degrees. It is now the U.S. which stands as the model of a democratic republic living out its ideals. By contrast, it is France, a country with huge ghettoes, racial unrest, little social mobility, and a general inability to come to terms with the reality of being a multi-racial, multi-ethnic, multi-religious nation, that comes up short. 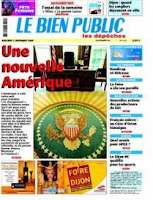 A recent headline in the newspaper Libération put it bluntly: “France: Where are our Obamas?” Various commentators associated with “terra nova,” a progressivist (and thus not inherently friendly to the U.S.) movement, shared their ideas on the need for France to change. Many of the suggestions were familiar: spending more on schools and social services, especially in areas where the poor are congregated, finding the right balance between assimilation and integration, welcoming what is positive about diversity, and moving beyond the lip service given to an ideal of equality. This ideal, it was claimed, remains formal and abstract, doing little but repeating the privileges of the privileged. Dossier Terra Nova / Libération : "Où sont nos Obama ?" la France de la diversité. Looking across the Atlantic, one commentator mentioned how for a long time the U.S. had served as a point of contrast, a sort of object lesson in how a republic could lose its way. Now, however, the “arrival of Barack Obama suggests that we should be less categorical.” The American experiment with affirmative action (“positive discrimination” as it is known here) was offered several times as a prototype. Also praised was the practice, booed at the Republican convention, of “community organizers.” Without using the phrase “rent control” another writer mentioned that no real social mobility can result until one great, often unrecognized barrier, housing prices, has been dealt with. One difference between the two countries has to do with the almost automatically pejorative connotation, in France, of “multiculturalism.” It suggests a sort of relativism where any community or culture should be allowed to live according to its own codes, ignoring, if it wishes, the principles of a democratic, secular republic. Cultural relativism is not widely championed in the land of “universal” human rights. The main fear is the large and still quite religious Muslim community. France, which had to wrest republican government by force from both a king and a Catholicism which was no friend to democratic life, is not multi-culturally flexible on the principle of a secular republic. There is plenty of room between France’s present notion of formal equality (all French people are simply “citizens,” no official surveys are taken identifying racial or ethnic classifications), and an extreme multi-culturalism. One small step was suggested by a writer from terra nova. Each night on the weather report, the following day is identified by the name of the saint associated with it in the Catholic calendar, i.e. “tomorrow we celebrate the Jeromes.” The French are not especially observant, but they are possessive about holding on to religious holidays. Why not, this writer proposed, add holidays from other religious traditions to the mix, especially Jewish and Muslim ones. France, after all, is home to large populations adhering to both those religions. For someone whose home is in a country where December holiday displays can include Menorahs along with Crèches, this sounds like a good place to start. Indeed, when Islam joins the mix, it sounds like a right path to follow for both countries. Labels: France, multiculturalism, politics, U.S.